As do many camera makers, Fujifilm has taken a seminal product (the X-T1) and attempted to make a more affordable version that mimics the original as much as possible, but at a lower price. This is what produced the X-T10. The two cameras share the same image sensor (16mp X-Trans), with the same on-sensor phase detection autofocus capabilities. The two cameras share the same DSLR-like design with retro-style dials and controls, though there are minor differences in many of those controls. Both models have a 3” tilting rear LCD and a high-density EVF, though there are differences in details. Each camera has WiFi, wired remote release capability, optional grip extensions, and supports UHS-II cards. Both models have nearly the same buttons and controls. The X-T10 is missing the ISO dial, front and top-plate Fn buttons, and Focus Assist button, but adds a back-plate Fn button. The X-T1 and X-T10 use the same NP-W126 battery. The X-T10 has a pop-up flash, the X-T1 includes an external flash. The pop-up in the X-T10 is less powerful than the included external with the X-T1. Both cameras have hot shoes to support external flash, though only the X-T1 has a PC Sync socket for studio flash use. The X-T10 is smaller, lighter, and trimmer in almost every way. The X-T10 is about 75% the volume of the X-T1 when all is said and done, and about 14% lighter. But the shutter speed and exposure compensation dials are smaller, too, while the ISO dial has been completely removed. As already noted, some buttons have disappeared on the X-T10, one has moved. The metering method dial underneath the shutter speed dial is gone, replaced by menu settings. The view through the EVF has changed. While both cameras have a 2.36m dot display, the X-T10 has a .77x magnification with a longer eyepoint of 23mm (compared to .62x and 17.5mm). The X-T1’s EVF just looks far bigger to the eye, especially with glasses on. The card slot on the X-T10 has moved to the battery compartment, where it’s less convenient (and very close to the door, so large fingers need not apply). The X-T1 supports UHS-II, the X-T10 doesn’t. The image buffer on the X-T10 is smaller than the X-T1. No UVIR version of the X-T10 is available. The X-T10 is not advertised as splashproof. 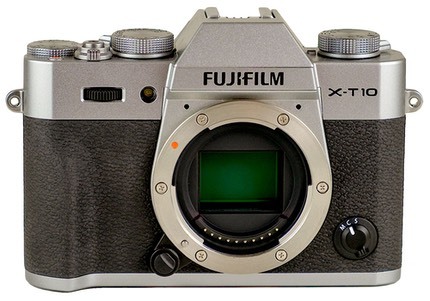 The retro-approach Fujifilm has been using in the X line pretty much comes over intact, and in some ways the X-T10 is a little less intimidating than the X-T1, as it moves away from the dial locks and dial-on-dial design to something simpler and more direct. The panda-style (silver-on-black) model I reviewed looks a lot like an older film SLR. In fact, one person seeing me shooting with it asked why I was still using film. The prism hump is more modest than the X-T1’s, even though it hides a pop-up flash. I’m a little worried about that pop-up, by the way: it’s clearly the most vulnerable area of the camera when the flash is up, with lots of recesses and nooks that dust and sand can get lodged in. It also doesn’t get the flash head itself nearly far enough away from the center of the lens, though it’s not red-eye I’d worry about, it’s lens shadow. Everything is once again housed within a magnesium alloy body. The mechanical shutter goes from 30 seconds to 1/4000, but with a rather slow flash sync speed of 1/180. There is an electronic shutter capability that works from 1 second to 1/32000. Yet it wasn’t those attributes that get all the attention. Instead it is the claims for focus performance and the 8 fps continuous shooting speed (only 3 fps with live view). Curiously, the X-T10 got focus performance tweaks from the get go that were later applied to the X-T1 via a firmware update. For a moment, the X-T10 was the better focusing camera, though equality has once again returned after the firmware change to the earlier camera. The built-in flash has a Guide Number of 16 ft (5m at ISO 100). As I noted, it has a big problem clearing the front of the lens, especially at wide angle, especially with the zooms, and especially if you’ve got a lens hood mounted. Inside we have the same 16mp X-Trans APS-sized sensor technology Fujifilm has been using for a couple of years now, though the sensor has phase detect capabilities built onto it now. For those that haven’t been following the plot, the X-Trans sensor uses a different color layout than a Bayer sensor, with more green photosites than Bayer, but also fewer red and blue photosites than a Bayer sensor. What that means is a better job at luminosity and noise handling at the sacrifice of color sensitivity. It also means that we still have the same potential color smearing issues to deal with. See my X-Pro1 review for more details; while most raw converters have slowly improved in their handling of X-Trans raw files, I still sometimes find issues, particularly in handling fine detail. For those not familiar with the sensor, it’s listed at ISO 200 base with a maximum of ISO 6400 for raw shooting. Fujifilm allows JPEG shooters to set ISO 100 to 51,200. Indeed if you set a value outside the ISO 200-6400 range, the camera will not let you select raw (and vice versa: if you’ve selected raw you can’t set the expanded ISO values). The 16mp nets you 4896 x 3264 images, which you’re recognize as 3:2 format. You can also set 1:1 and 16:9 aspect ratios while shooting. Frankly, this should be an easy feature to implement, so why you can’t also set 5:4 (standard print ratio), 4:3, and maybe even sub-crops like 1.2x or 1.3x I don’t know. 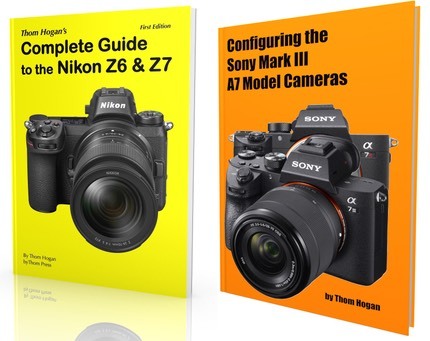 True, such a range of choices would add complexity to the camera, but this camera is targeted at a user who understands and will master that complexity. Video users aren’t going to be overly impressed by the features or performance, though we do have 1080P/60/50/30/25/24 as well as the same choices in 720P. There isn’t a headphone jack, for instance, and the microphone jack is actually shared with the remote control, which requires that you change a setting on the camera to go back and forth. You can also use a smartphone app via WiFi to do basic control of the camera. At less than a pound (381g) and modest overall dimensions, the X-T10 is tackling the lower end of the prosumer crop sensor cameras of Canon and Nikon, but in a potentially smaller, lighter package. The battery used in the X-T1 is the NP-W126, which is rated to 350 shots CIPA, which is still on the wimpy side for a performance camera. Remember, using the internal flash could cut that significantly. Price of the camera (body only) is US$800, which is a substantial discount from the X-T1. The camera is made in Thailand. Like the X-T1, the X-T10 feels substantial when you pick it up, and the retro style controls are for the most part self-explanatory. The shutter speed dial can be rotated freely, with the A position used for Program and Aperture priority exposure modes. Besides the usual one-stop apart values we have a 180x position for flash use, plus T (time of 2 to 30 seconds) and B (bulb). Shutter speeds go down to 1 second on the dial. Note that unlike the Nikon Df, the X-T1 doesn’t really lie to you about shutter speed. If the dial is set to anything other than A, what you see is what you get as your shutter speed. If you need to override that in partial stops, you can via the rear dial, but you’re never far from the actual speed listed on the dial. That’s retro properly done (as opposed to the Nikon Df’s improperly done method). Exposure compensation is controlled by a dial at the right top edge of the camera (+3 to -3 EV). This dial is stiff but is at the very edge of the top plate, so it is a bit prone to being accidentally moved. I’m not a fan of location of the 0 position as you have to tilt the camera top back towards you to be sure you’re at zero, but as with the X-T1 I’ve adjusted to it. The shooting method dial is at the top left of the camera as you’re shooting, and includes the panorama and multiple exposure modes. As with many of the dials on the X-T10, this dial can get out of its click stops to an intermediary and indeterminate position. It’s not a big deal, but absolutely make sure that as you move a dial on this camera that you’re moving into a click-stop position. Two command dials (front and rear) are available, though they’re mostly underutilized. The front one allows you to select finer shutter speed options (and the T setting), the back one controls apertures on XC lenses. You can swap the functions via a menu setting (which Nikon users will likely want to do, as Nikon default is aperture on the front dial, shutter speed on the rear dial). The only other significant use of the dials is during image playback (back = magnification, front = image). On the X-T1, people complained about the recessed Direction Pad buttons. Mine are so recessed that it always takes me a moment to press one. Fortunately, the X-T10 corrects that problem with the Direction Pad buttons sticking out from the back a reasonable amount. Likewise, with two exceptions, the buttons on the X-T10 stick out appropriately, as well. The exceptions: the record movie button on the top plate, and the Fn button on the back. The movie button I don’t mind being recessed. But the Fn button I do. Moreover, this button is in a hand-twisting position when you’re shooting. I’d say it’s the most glaring design issue in terms of usability/accessibility on the camera. The Fn button should have been just above the Q button, instead. While I was prepared to dislike the smaller viewfinder eye cup, eye position, and change in magnification. Overall, I found that nothing really bothered me. Yes, light coming in from the sides can be a nuisance and make you want a larger eyecup, but most of the time I just enjoyed the view the Fujifilm EVFs give you. With my glasses on, I can just see into the corners of the display. Out back, the LCD tilts, but not a lot (90° up, not quite 45° down). As others have noted, this is a tripod friendly tilt, as the LCD never swings lower than the bottom of the camera. But it’s not a selfie tilt, and it’s tilt only. Useful, but not as useful as alternatives these days. I mentioned the menu system in previous Fujifilm camera reviews. It’s a bit of a scroller, with over 50 menu items that can be set. I’m not going to quibble about it here other than to point out that Fujifilm, like most other camera maker, doesn’t use either a “most commonly used” or a solid “grouping” method that makes intuitive sense in terms of ordering the menus. They do better than most companies do. But White Balance, a commonly set item, falls to the second menu page, yet it’s appropriately in the top row things to set with the Q (quick) menu button. Also, Fujifilm doesn’t wake the camera on a Menu button press if it’s in power conservation mode. You have to press the shutter release part way to get the menus accessible again. That’s also true of the Playback button, too. This should be changed. Also like the previous X cameras, when the camera times out to conserve battery, you must press the shutter release to get it back responding. Pressing the Q or Menu button won’t do it. Nit: the AF-L button is far too small and tough to find. It sits in an awkward position just above the ridge in the thumb rest on the back of the camera. For a camera that touts its focus performance and abilities, we need controls that allow us to tweak that performance in real time that are right where we want them and easy to find. We’ve also lost the Focus Assist button on the X-T10, though I wasn’t prone to use that on the X-T1. Overall, the handling on the X-T10 is much like that of the X-T1, which is to say quite good with a few nits and quibbles that you’ll probably get used to over time. Battery: I’ve actually been doing a bit better than the CIPA numbers on my X-T10, once again getting a bit over 400 frames a charge, as I did with the X-T1. Still, that ain’t serious DSLR territory, so extra batteries are the name of the game for X-T10 users. Video: Sadly, the X-T10, like all the X-Trans sensor cameras, just isn’t a great video camera. The pixel orientation coupled with the pixel size means that Fujifilm is having to do some fancy mapping to get video pixels, and it shows. X-Trans videos just seem “rougher” than videos from 16mp Bayer cameras. Sometimes the roughness is a bit of artifacting on movements or edges, sometimes it’s a bit of blurriness to the pixels. Write to card: Okay, Fujifilm has moved up in the world. Sort of. The X-T10 has a modest buffer size (max 7+ images in raw modes, 20+ frames in JPEG modes). At 8 fps you should have a second of buffer shooting raw, max. Fujifilm cameras (dating all the way back to the S1 DSLR) have had a reputation for slow writes to cards. Unfortunately, that’s still a bit true. Buffer full writes of raw files were still taking 10-20 seconds on most of my 45MBs UHS-I cards, including a Fujifilm-supplied card. Part of this is the huge size of the X-T10’s raw frames: 32MB. Fujifilm needs to look into lossless compression for those raw files. My D800 can write its 36mp raw files smaller than the X-T10 does its 16mp ones, and it writes them faster, too. Indeed, one of the key shooting differences of the X-T1 versus the X-T10 is the change in buffer size and the lack of UHS-II support. If you’re a rapid, continuous shooter, the X-T1 is a better choice, though you’ll need UHS-II cards. Bottom line: Absolutely avoid cards that are pre-UHS-I and less than 45MBs. Autofocus: When the X-T1 first came out with this same autofocus system, Fujifilm made some bold claims for it that didn’t quite prove out in field testing. The X-T10 actually added some to the abilities and performance of its bigger brother, but it didn’t make a dramatic change to my conclusions about focus performance, especially with some lenses. Tracking has improved a bit with moving subjects over previous models, and sometimes gives DSLR-like performance for certain types of subjects. However, note that this kind of tracking only happens with the nine most central AF sensor areas. I found it a bit hit or miss in fast moving situations, especially with longer lenses, but when it hits, it hits. As with the X-T1, the X-T10 has responsive-but-not-always-right autofocus. See my extended comments in my X-T1 review for more about that. Then there’s the fact that we’re using an EVF. Despite the fact that the X-T10 uses an EVF with a very fast refresh rate, we still have a slight lag, and that’s especially noticeable when you’re shooting continuously on a fast moving subject that moves past you. I had a tough time with longer lenses on the basketball court with this camera. The tendency is to tend to fall a bit behind on framing, which may impact your focus tracking. Moreover, getting images exactly when you want them in a sequence is impossible when the camera is hiccuping between shots. Another interesting thing about focus is that tracking may slow the frame rate. This was a real surprise to me when I first encountered it with the X-T1, and now again on the X-T10. The camera started at 8 fps but I was getting sequences that were more like 4 or 5 fps. Say what? It turns out that with faster moving subjects the camera won’t shoot until the lens has caught up moving the focus position. In a way this is a bit of what we Nikon shooters would call “setting AF-C to Focus Priority.” While there is a “Release Priority” option on the X-T10, it still slows the shooting rate down when invoked, particularly with long lenses like the 55-200mm. In some cases I saw no tangible difference between frame rate of Focus Priority and Release Priority. Image Quality: I keep getting flack for writing about the X-Trans sensors’ shortcomings. Even though the raw converters have caught up a bit to where they should be with the X-Trans layout, I still find low-level detail issues I need to deal with often enough with the X-Trans results that I find it a bit annoying. Adobe has worked with Fujifilm and it now gives a better, but still not state-of-the-art raw conversion. A few other converters seem to do better jobs; especially Iridient Developer (unfortunately Mac only). I repeat this warning about raw files for a reason: I’ve never found Bayer workflows to require me to do a thorough check on low-level detail and then backtrack to attempt to fix something. I keep finding Fujifilm images where the raw converter I’m using on any given day “burped” on something that I then need to go back and see if I can do a better job with. It’s a petty annoyance, to be sure, but as you know by now I don’t like annoyances. Fujifilm’s claim for X-Trans of “no moire” and “better detail” really hasn’t played out, I think. X-Trans can still produce moire, and it sometimes has trouble with certain types of detail. It’s all a balancing act. Bayer is what everyone uses for a reason: it balances the underlying data needs the best. Fujifilm is goosing one thing and getting an egg in another with X-Trans. That said, at this point in time, 16mp is the bigger problem with the X-T10. Simply put, we have plenty of 24mp or higher APS-sized sensors that produce more detail. So Fujifilm’s claims for X-Trans might be true against other 16mp sensors, but the pack has moved on, and Fujifilm will need to, too. I worry that Fujifilm’s low production volumes will keep them towards the back of the moving pack, though. They’ll get to 24mp and others will be moving still upwards. The real gem in Fujifilm’s jewelry is their handling of color, not detail. Always has been, and continues to this day. They were the first to use color twists in their model, and they have extensive studies on color perception backing up what they do. To say that Fujifilm’s color is good is incorrect. It’s highly pleasing. Out of camera JPEGs are styled to match perception patterns they’ve been targeting with their films and papers for decades. While Fujifilm fans often proclaim about how wonderful the JPEGs are, I find them a bit contrasty, while fine detail (especially in greens) is a bit on what I’d call the smudgy side. Then there’s the classic Fujifilm double hue shift, which makes it more difficult to change color values after the fact should you want to. No doubt there is drama in the out of camera JPEGs and most people will perceive them to be excellent, but it’s not the best image the camera can create, IMHO. Still, it seems that in the intersection of color rendering, detail, and tonality, no one has gotten all three “right” when decoding raws for the X-Trans sensor. In terms of detail, Iridient Developer seems to pull out the most detail and color and tonality. Capture One does a pretty nice job, too, with better color and tonality and a slight drop in detail. The worst of the bunch in my opinion is the one most people would try to use: Lightroom or Adobe Camera Raw. For more on this subject, see my Fujifilm X-T1 review. Running the same image through ACR and setting the black, white, and mid-tone points correctly, you’ll note that the contrast goes down (mid-tones come up) and the colors lose just a little of their zap. Nothing has changed in terms of dynamic range that I can see. Very good, and very recoverable shadow detail. In terms of noise, the X-T10 generally doesn’t produce much. The extra luminosity values help, sure, but Fujifilm also has a very well tuned noise reduction scheme that doesn’t really show its impact on detail until about ISO 3200 on JPEGs. Of course, ISO 3200 on my X-T1 and X-T10 requires a longer shutter speed to get the same density of exposure than on my D7200 ;~). Thus, ISO 3200 isn’t actually ISO 3200 when you compare two cameras. Things get really tricky to explain when you start trying to factor in the DR expansion modes, but I’d say that the X-T10’s marked ISO values will likely be a minimum of a half stop from other cameras you might be using, possibly more depending upon the camera. That said, noise propensity should still be considered quite low. So low that I think Adobe’s default color noise correction is actually too much. Moreover, you don’t tend to get patterned noise or chroma noise at ISO values that the traditional Bayer competitors will start showing it. The in-camera JPEGs do a far better job of not blocking up color at higher ISO values, while Adobe’s converters clearly block up color at higher ISO values. One final image quality point: Fujifilm made a big point of “no moire with X-Trans” when they introduced it. Having now had a lot of experience with the sensor with numerous cameras I can tell you that it most certainly can produce moire. It tends to do so at a different frequency and will far less regularity than the Bayer sensor, but it’s still possible to generate false artifacts on fine, tight detail. The good news is that the moire doesn’t tend to have a color component to it. Don’t get me wrong, image quality from the Fujifilm X-Trans sensor is good. Quite good. For most people it is clearly well above the “good enough” bar. However, at the high end of a camera lineup you need to be prepared to go up against the best competition, and I feel like the Fujifilm 16mp APS X-Trans is just not fully justifying its differences against 24mp Sony EXMOR and Nikon technologies. Put another way: if Fujifilm were to use the Sony 24mp Bayer sensor in the X-T10, I’d want that over the sensor they used. Funny thing is, the X-T10 is enough like the X-T1 to make me scratch my head a bit. At US$500 less, it doesn’t have nearly close to US$500 worth of differences and cost cutting visible to the casual observer. The big one for me and the type of work I tend to do with this camera is the lack of beefed up weather sealing on the X-T10. That’s added to by my worries of grit and sand getting into the pop-up flash well if I use that flash. Things that I thought my be deal breakers, such as the changes to the EVF, turned out to be not as important as I believed. Yes, if I go back and forth between the two cameras, I’d pick the X-T1’s viewfinder over the X-T10’s every day, but when I just used the X-T10 in isolation, I quickly forgot how big and dramatic that X-T1 EVF is. The button/dial changes? Not particularly important to me. Both cameras have some small issues here, but different issues, and none really is a deal breaker. Performance? I can’t find any real performance differentials, though I did note that the X-T1 cleared a UHS-II buffer a bit faster than the X-T10. Focus performance and image quality are as identical as they can be, though. So who wouldn’t take the discount and be happy? Probably very few. In essence, Fujifilm has picked up all the early adopters with the X-T1, and now is trying to vacuum up the remaining interested folk with a very close X-T10 clone at a lower price. I think it safe to say that the X-T2 isn’t all that far off, is likely 24mp, and will tip things back towards the early adopters. Most likely, we’ll see a 24mp X-Pro2 first, though. In other words, Fujifilm is likely to do the same thing again with a slow roll from All the Bells and Whistles to Most of the Bells and Whistles to Just the Bells and Whistles that are Most Important. Another way of putting that is that buying an X-T10 is likely buying into the tail end of the 16mp X-Trans stream. Nothing wrong with that, as you get substantive discounts by buying towards the tail of a cycle as opposed to at the start. Personally, I wish Fujifilm had a better kit lens choice with the X-T10, though. The 16-50mm f/3.5-5.6 lens is small and light, sure, but it also is one of the lenses I’d say are under performers in Fujifilm’s lineup. It has strong barrel distortion at the wide end, and while the central area is strong throughout the zoom range, the corners are decidedly less so. The body is pretty high end, yet this kit lens is more low end, in other words. This seems like a bit of a mismatch to me. Of course Fujifilm would love to sell you other lenses and has the more expensive option of the 18-55mm f/2.8-4 available, but realistically, not a lot of those Fujinons really live up to the “power in a small package” vibe that the X-T10 body itself gives off, and once you buy into the higher end lenses, my personal preference would be to put those on the higher end body, the X-T1. I tried a number of other lenses with the camera, such as the 18-135mm and the 16-55mm, and those felt a bit big on the X-T10, especially the 18-135mm. The 18-55mm and 10-24mm are appropriate and nice sizes for the X-T10, and became my primary zooms I used with the camera. But realistically, the camera really shines with some of the better primes, and it handles best with the smaller primes. Overall, Fujifilm has another winner with the X-T10. They’ve kept virtually all the X-T1’s goodness and haven’t introduced anything crippling. The only real reasons to buy an X-T1 over the X-T10 are the EVF and splash proof nature of the bigger brother, but the X-T10 holds its own everywhere else. Thus, the US$500 lower list price (US$300 in terms of current street prices) of the X-T10 is highly tempting. If you’ve been thinking seriously about the X series, the new low price of entry to a very high specification should be quite tempting. 2018: this model is out of production and no longer available new. But used copies can easily be found. Also, check out the current X-T20 model.